Developers with SouthStar LLC and Highwood Properties Tuesday announced plans to build a new mixed-use project, including retail, hotel, residential and office space, in Cool Springs. 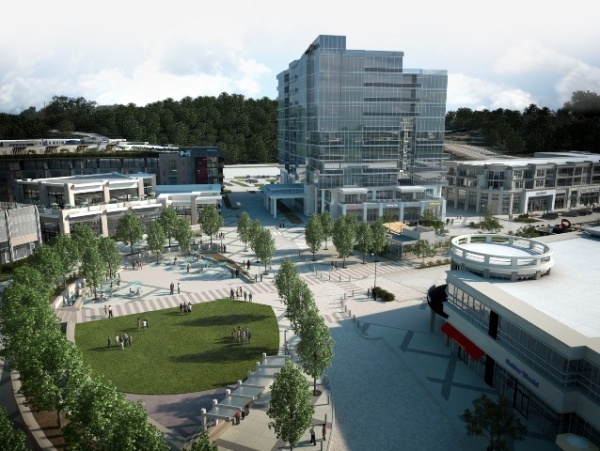 The estimated $700 million development, called Ovation, is located on a 147-acre site at the southeast corner of McEwen Drive and Carothers Parkway. Highwood Properties is the master developer for Ovation and will develop, own and manage the office space. Highwood owns more than 2.6 million square feet of office space in Williamson and Davidson counties. “Ovation will be an ideal environment for companies seeking a range of workplace environments,” said Ed Fritsch, president and CEO of Highwoods. Approximately 57 acres, or just under 40 percent, of the site will be preserved green space, including three hilltops. The remaining 90 acres will include 350,000 square feet of retail and restaurants; 1.4 million square feet of office space; a 300-bed hotel; and residential space, including homes for sale and rent. SouthStar will develop the retail space the hotel. They will team with Franklin-based Bristol Development Group. The development team says it is collaborating with local government, organizations and business to create a community that can connect to any future mass transit projects. “Our main entrance on Carothers Parkway will include safe pedestrian access for people walking over from the neighboring Vanderbilt Medical campus,” Wilson said. SouthStar and Highwood purchased the property in separate transactions for $25 million, Infrastructure construction is set to begin in the first half of 2014. For more information on the development, including pictures and video, click here.